Do you like working with kids? Do you believe you can inspire students to learn? Are you looking for a career that uses your skills, strengths and experience? 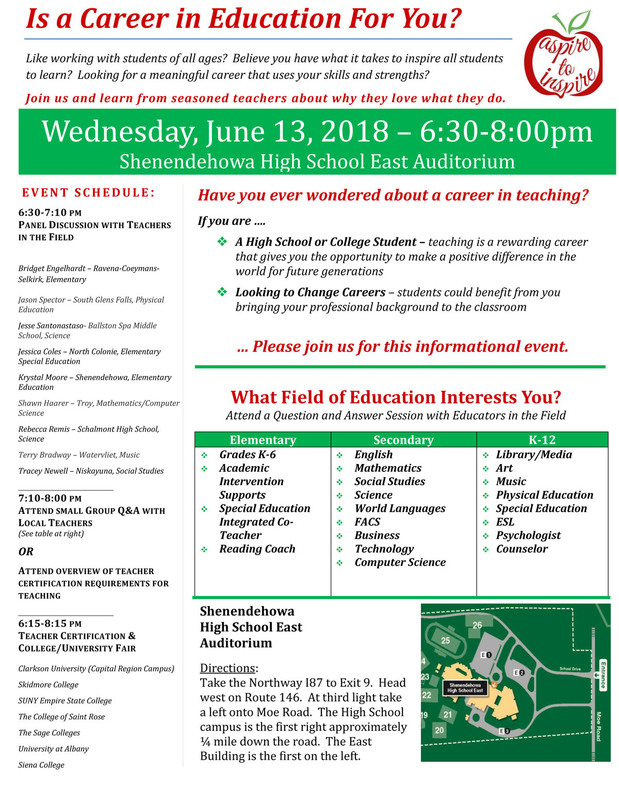 Whether you are a high school or college student thinking about the future or a professional looking to change careers, please consider attending an Education Career Exploration Fair scheduled for Wednesday, June 13 from 6:30 to 8:00 p.m. at Shenendehowa High School East in Clifton Park. School administrators from the region have organized this event to highlight the rewarding career opportunities available in education, including for mid-career professionals who can bring work and life experience into the classroom to benefit students. Come talk with current teachers about why they love what they do, and learn about the need for passionate and dedicated individuals to choose a career in education. Directions to Shenendehowa High School East: Take the Northway (I-87) to Exit 9. Head west on Route 146. At the third light, take a left onto Moe Road. The high school campus is the first right approximately ¼ mile down the road. The East Building is the first on the left. This program will take place in the school’s auditorium.